The Wesleyan Argus | What’s Red & Black and New All Over? What’s Red & Black and New All Over? 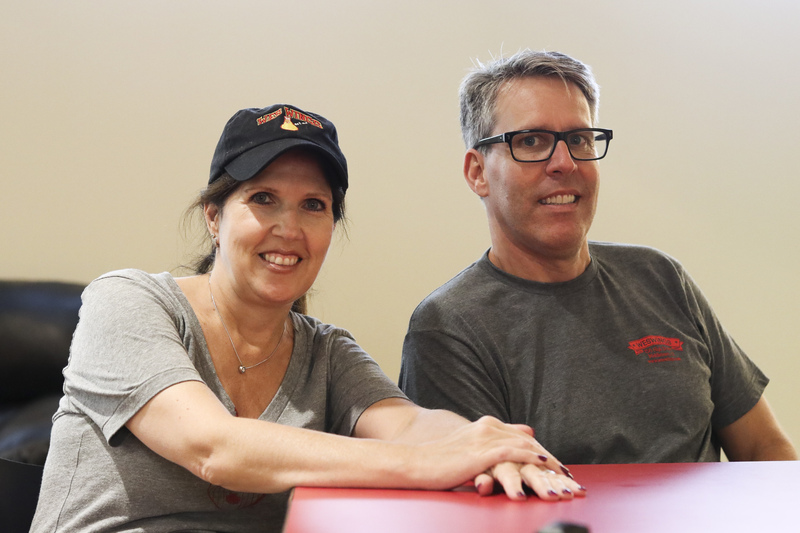 Through turbulent times at 45 Broad St., Ed Thorndike ’89 and Rob DeRosa have managed to keep the Red & Black Cafe above the noise. The opening of the new Wesleyan RJ Julia Bookstore last spring marked the end of a quiet but lengthy saga where the University sought to relocate their official bookstore, previously known as Broad Street Books. Red & Black and the bookstore had cohabitated since the University purchased the space in 2003, and they were peaceful partners until the University’s first attempt at relocation in 2012. Thorndike, the owner of Red & Black Cafe and WesWings, spoke strongly against the plans when they were first announced. He feared that the Cafe was at risk of meeting the same fate as the old bookstore, and described himself as “stunned” in a post on the restaurant’s website. Students were no more pleased than Thorndike at the prospect of losing the Cafe. “If there’s any sort of consensus among students, it’s that Red & Black needs to stick around whether or not we make the move,” Andrew Trexler ’14, the former chair of the Wesleyan Student Assembly’s Finance and Facilities Committee, said at the time. The bookstore, and therefore the Cafe, ended up staying at its Broad Street location. Student objections seem to have had a lasting effect; when relocation rumblings began anew in 2016, questions surrounding the Cafe shifted from “will it survive” to “how much will it be allowed to expand?” Even when the campus became enveloped in controversy over the RJ Julia bookstore’s allegedly unfair and discriminatory hiring practices, the Cafe remained untouched and unharmed. With the Wesleyan student body on their side, Thorndike and company seem to have earned protected status for years to come. The Cafe opened for the year on Saturday, Sept. 2, delighting customers with a more-group friendly design and a creative use of space to nearly double the room’s seating capacity. During the week prior to its opening, The Argus caught up with Thorndike and DeRosa at the semi-furnished Cafe to discuss the construction process, the RJ Julia controversy, their plans for the extra space, and more. The Argus: How close is the space to a finished product? Will you be at full strength this semester? Rob DeRosa: Food-wise, we’ll certainly be ready. We’ll be shy a few tables because there are more coming in soon. Ed Thorndike: Yeah, we have about a half dozen new tables coming in, which won’t be in-store until I believe September 9. But when we ordered them we knew we wanted to wait a little longer to get our ideal furniture than to rush it. Once the tables are in, we’ll have two big ones that seat about six to eight people, one on each side of the room. Then we’ll have our full set of bistro-style tables by the back, and we’re getting some couches and soft seating. We’re envisioning that the line will come from the door through a clear path down the middle of the room. So we should have approximately 50 seats inside. RD: And that’s not even counting our outdoor seating. ET: Yeah, that’s another thing. We’ve always had outdoor seats, but with the old door being so far away, I don’t think people really thought to sit and eat there. But now, especially with the windows open and the seating being immediately visible, I think that space becomes much more appealing. A: Wow. So you were seating, what, 20-25 people before? That’s a huge improvement. RD: Yeah, probably closer to 25. Depending on how you pulled chairs around, people got creative with it. But effectively, we nearly doubled our seating, which is lovely because we want groups to feel comfortable. ET: Yeah, and we hopefully are accomplishing that by bringing in larger tables too. It’s always been great to come with one friend, or to come study by yourself, which I’m sure there will still be lots of, but it wasn’t as conducive to more than that. Now hopefully students will come down with five, six, seven, or even more people and know that you’re going to get a seat. A: When did you officially get started on the construction of the new space? ET: It was about the middle of the summer that [the University] decided to do this. The wall itself [between the Cafe and the former Broad Street Books space] is temporary, and we still don’t know what’s going to happen on the other side. So it’s entirely possible that the wall eventually may come down depending on what they want to do. I know there have been ideas discussed, like making it a performance space, opening up the whole space and making it almost a cabaret type of place. You could have performances, where the Cafe is open so you have food and music, poetry, or whatever else happening. I also think they talked about turning the basement, lower level into an art studio space. A: So the University basically decides what will happen with all of this building? ET: The University owns all of this building, and also that building now [motions to 37 Broad St. next door]. They purchased that just last spring, I think what’s going on right now is that PAC [Public Affairs Center] is gonna be renovated and those offices will be moved down here temporarily, and then in the future it will be used as space for wherever else on campus is being renovated. RD: They’re looking for the best possible use, so they aren’t going to decide immediately. A: Do you guys have specific preferences? Would the performance space idea be your top choice? ET: When they mentioned that to us, I said ‘that’s a home run.’ Ideally, it would be student space, whatever that may be. We prefer that the building be a hub instead of storage or office space. RD: We definitely have ideas of what we would like to go in there. And the University might take our input. I think they probably will, they’ve always been nice like that. But if they didn’t like our ideas, they won’t go ‘we have to do what you say’, either. This is all supposition anyways, and we’re mostly just happy to be opening soon, to still be here. A: How were you all affected by the RJ Julia protests last spring? RD: We weren’t active in it. We liked the bookstore people, and we wish them luck, basically. But we didn’t lose any business because of the protests, kids still came here. ET: We got to know several of the staff members from the bookstore at the end, as they were closing things down, and it was hard and sad because I know a lot of them were not going to the new place. We let them know that although their experience was in bookstores, and we didn’t necessarily have anything available immediately either here or at WesWings, that we would be available as professional references to help them land jobs, that we’d be in touch if we ever had anything come up where they would be a good fit for us. They were good staff, and they were definitely people that we would hire if we had the opportunity. A: Do you think that RJ Julia having its own cafe will affect your business at all? RD: No. Students can’t use their points there, and it’s rather expensive for college kids. ET: Yeah, my impression is that right now it’s more geared towards Middletown professionals. The bookstore itself is just way more Middletown-focused than the old store, which is why it’s down on Main St., but I guess it’s yet to be seen. Over the past several years, we’ve had our own clientele who came in regardless of the bookstore. We might lose that first-week rush where we were especially busy from people buying their books, but it’s not like we’re going to lose people from Junior Village. RD: We’re certainly gonna add food items as we go along, new sweets and new sandwiches. We’ll be adding constantly as we go along, so hopefully, it should be as exciting as it ever has been for the students, or even more so. We’re gonna be as funky as always.